This story really got the tear ducts goin’. In 2016, Butler, Pennsylvania residents Tanya and her husband adopted one-and-a-half-year old pup Joey, who had been found at six weeks with his legs intentionally cut off. Joey was rehabilitated and received prosthetics that have made a huge difference to his life. They were so deeply affected by their experience with Joey, that in 2017, they started an organization, Joey’s P.A.W. (which stands for Prosthetics or A Wheelchair). 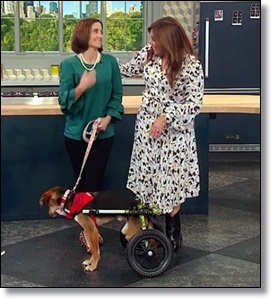 Their goal is to help other disabled dogs achieve mobility through partial or full prosthetic and/or wheelchair funding. To read more on this story, click here: This Woman Helps Disabled Dogs Walk Again!